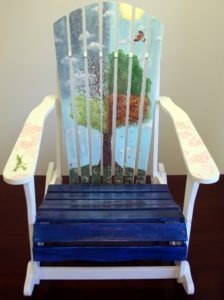 Explore Connecticut One Chair at a Time! Bradley International Airport has partnered with Connecticut high schools to introduce usable art pieces in the terminal. 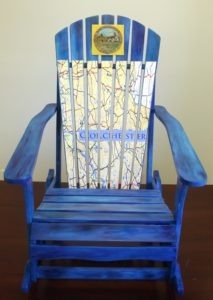 Nine uniquely designed Adirondack rocking chairs are now located throughout the airport. 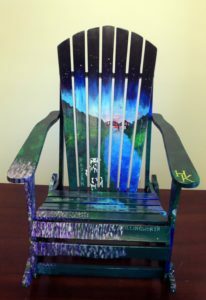 Each one was designed and created by high school students. We are pleased to showcase their talent! And a special thank-you to the staff and administration of each school for supporting this program. Berlin High School: The natural beauty of the State is highlighted with the Charter Oak Tree and the State mammal, the Sperm Whale. 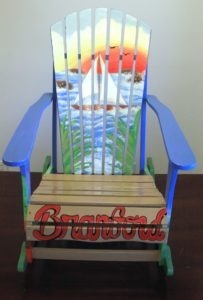 Branford High School: With a picturesque water scene on the front of the chair, the design celebrates the town’s connection to the shoreline. 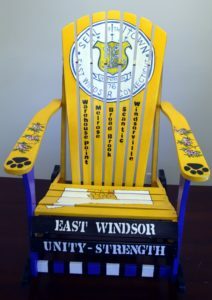 East Windsor High School: The golden color of the chair represents the school and creates a welcoming feel. Tobacco farming & the CT Trolley Museum are featured. 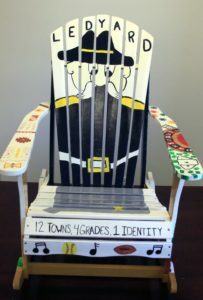 Haddam-Killingworth High School: An impressive design represents each of the towns in Region 17. 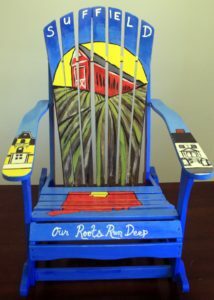 The East Haddam Swing Bridge, over 100 years old, is depicted on the front of the chair. Ledyard High School: The design honors the past, Colonel Ledyard; the present, the Ledyard Fair; and the natural beauty of the town, the Thames River. 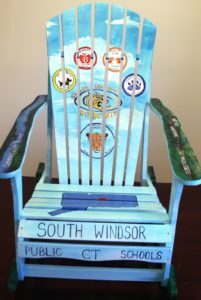 South Windsor High School: A beautiful blue sky is carried throughout the chair’s design as your eye drifts from agricultural highlights to school pride. Suffield High School: This design represents the agriculture, landscape and architecture that is specific to Suffield. Bacon Academy: The school colors, blue and gold, set the backdrop for a design reflecting the students’ pride in Colchester an Bacon Academy. 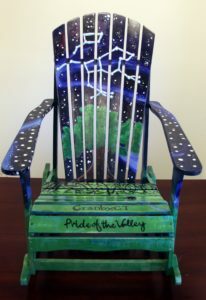 Granby High School: The Ursa constellation on the front of the chair ties in with the school mascot, the Granby Bear.